James II (1430-1460), King of Scots, used his influence and Royal favour to assist Bishop William Turnbull in founding the University of Glasgow in 1451. By granting his protection and exemptions from taxation, he helped ensure the University's survival during the first decade of its existence. James was the son of James I, and succeeded to the throne after his father's murder in 1437. His minority was a turbulent one, marked by conflict between the country's most powerful nobles. During the early 1450s he led prolonged and ultimately successful military campaigns to break the power of the Earls of Douglas and their allies. William Turnbull, Bishop of Glasgow, was an important ally and a Royal councillor during the King's struggle with the Douglases, and James rewarded him by granting commercial and political privileges for Glasgow. Turnbull was also eager to erect a university in the city, which would bring further prestige and commercial advantages. James would have been aware that the establishment of a university in the West of Scotland would produce cadres of young men to serve not only in the Church but also in the administration of Royal justice and government. He readily agreed to write to the Pope, Nicholas V, asking that a university be created in the city. 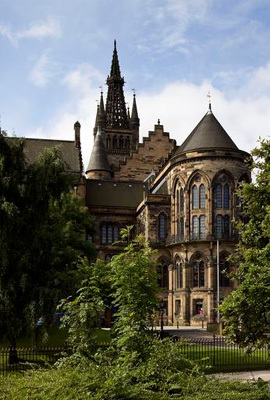 Nicholas agreed, issuing the famous Papal Bull of 1451 which erected in Glasgow a studium generale with privileges similar to those that had been granted to the University of Bologna. In 1453 James referred to the University as "our most beloved daughter". He granted it his peace and protection and exempted most of its officials and the students from Royal taxes and duties. This practical support was particularly welcome during the early years of the University's existence, when it struggled to survive without buildings of its own, and with only slight and insecure sources of income. James' success in war was partly the result of his appreciation of the value of artillery. Ironically, he was killed in 1460 when one of his cannons exploded as he inspected it at the siege of Roxburgh Castle.